If you’d like to expand your mind to items you may not have even considered, here is a list below that is quite a comprehensive array of things that you may be glad you stored. Many of these items I haven’t seen on other lists. I found these on the Survivalist Blog. This is a great resource when planning for a future where we may not have all the conveniences we enjoy right now. Shoe and boot laces – yes, you could use leather laces but why not stock some? Kits to fix garden hoses – because you can stock 10 hoses but what happens when they break? Pea shellers, corn huskers, apple peelers and corers, etc. – all those “yankee tools” that our grandparents had but we no longer use. Mimeograph machine and supplies – IF you can find one. Measuring spoons – metal with engraved markings. Old time photographic equipment – could be a new business! Wind up clocks – how else are you going to keep time if the grid goes down? Black and brown paint – useful for camouflage, hiding things, and making makeshift showers plus a myriad of other uses. 101 things that you probably already own – but may want a more durable version for use in an emergency or when the grid goes down. Hot pads – Replace any worn out or not very thick ones. Mitts are probably best. Silicone can handle very high temps. Matches – You can’t have too many! Duct tape – obviously you can’t have too much of this! Hammer – is yours in good shape? Screwdrivers – did you buy a cheap set or good quality drop forged steel ones? Brooms – are yours good quality straw or cheap plastic? Are they in good shape? Nails, screws, bolts – making these by hand is a royal pain in the posterior. Plastic bags – bread, ziplock, etc. Maps – road atlases, road maps, etc. Baby supplies – bottles, blankets, clothes, etc. 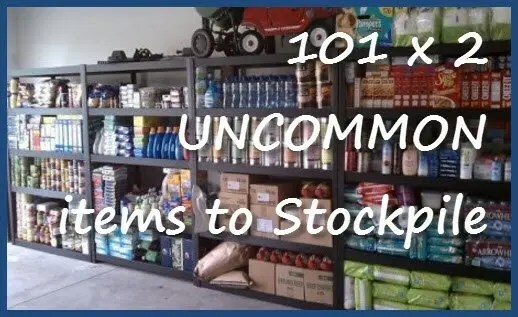 If you’re like me, you still have baby stuff tucked away in your storerooms – even if you don’t have a baby after SHTF, you can always trade the stuff…..
Bicycles – are yours all set for hard use? Air mattresses or cots – chances are good you’re going to have guests – where are they going to sleep? Kitchen utensils – you want metal ones or wooden, not plastic. How about skis and/or snowshoes with polls. Good list.I didn’t see zip ties large and small.can fix a fence to hog tying a person.